Was Archimedes' Father Really an Astronomer? You’ll find many authoritative sources telling you unequivocally that Archimedes’ father was an astronomer. Have you ever wondered how good the evidence for this claim is? The question itself has wider implications for our pursuit of knowledge. Casual readers are usually too busy to discover how much evidence exists for ‘facts’ on the web. At one level this is perfectly rational – if we had to research carefully the source of every fact in our possession, we’d have no time to do anything else. But in science, it can mean the difference between hero and zero. In Surely You’re Joking Mr. Feynman, Richard Feynman tells the tale of how he came to discover a law of nature: he discovered how an atom decays when it emits a beta-particle. He made his discovery at about the same time as other physicists did. He would have got there first if only he’d ignored physics textbooks; he made his breakthrough only when he assumed the books were wrong, as indeed they were. If only he’d remembered that when he needed to! Anyway, getting back to Archimedes and his dad. Amanda shed her clothes on to the floor. A man dashed her clothes on to the floor. The meanings are rather different. Problems could arise! President Lincoln ate a pleasant meal two hours after he was shot. President Lincoln ate a pleasant meal; two hours after, he was shot. 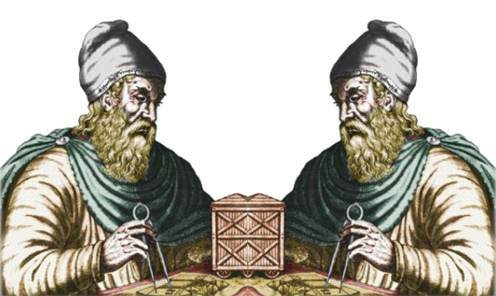 In the case of Archimedes, we should consider ourselves lucky that anything has survived at all; his words, numbers, and diagrams, written on parchment scrolls in the third century BC, have come to us after being copied and re-copied a large number of times. With each new copy, errors were almost invariably introduced by a scribe – like children playing a game of telephone. Passing on a message in a game of telephone. When someone first had the bright idea of introducing word spacings, scribes copying ancient screeds needed to decide where the spacings should be placed, providing new opportunities to introduce errors. And that’s why we believe Archimedes’ father was an astronomer. Realizing how hard scientists – in this case linguists – often have to fight for so many of the facts we take for granted can be a humbling experience. You’ll have to make your own mind up about whether they got this one right! Images of scientists digitally enhanced and colorized by this website.